Our theme for this week was...you guessed it...money. A library trip, Lemonade stand and even a chore chart all go into teaching an important lesson! We started by finding some library books. One Cent, Two Cents, Old Cent, New Cent: All About Money is a good introduction to money (history of, how it's made...). Like many informative books, it is a little over Isaac's head, so I reserve the right to pick and choose which sections I read. 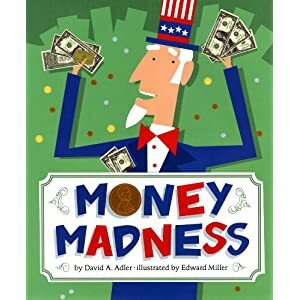 Money Madnessby David Adler does a good job of explaining how money is used. Then we made a quick game of memory by sticking pairs of coin stickers on note cards. You could easily do the same by just taping real coins on note cards. Playing memory with coins was actually Abby's idea and turned out to be a good way to help them practice saying the names of each coin and matching same-type coins together. Then we got entrepreneurial and set up our own Lemonade stand. Isaac colored in the sign and helped mix the sugar into the fresh-squeezed lemonade. Abby and Isaac enjoy an ice pop on the house while waiting for our first customers. Thanks to the friends who came out to support my kids' first attempt at business! We did a lot of other small activities with money this week but honestly I think the most valuable for Isaac was sitting there playing with the coins while he waited for customers. 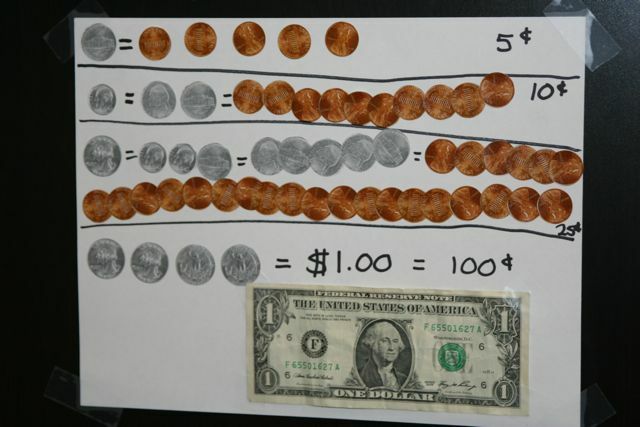 We played little games while we waited: How many pennies are in a quarter? Find all the dimes. Put the coins in order from lowest to highest worth. Which one is worth five pennies? 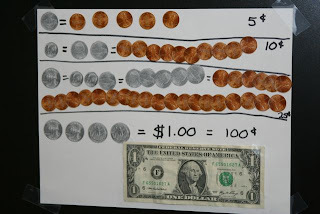 I ended up making a chart using those coin stickers to help the kids remember how much each coin is worth. For now, we stopped at a dollar, because it's going to be a while before they need to know the bigger bills. That's for the next lesson! Finally, I have been inspired by this week's theme as well as by a few of my friends who are teaching their young children to value of money by earning it themselves. So I created a chore chart where the kids can see how much they will be paid for each chore they do.